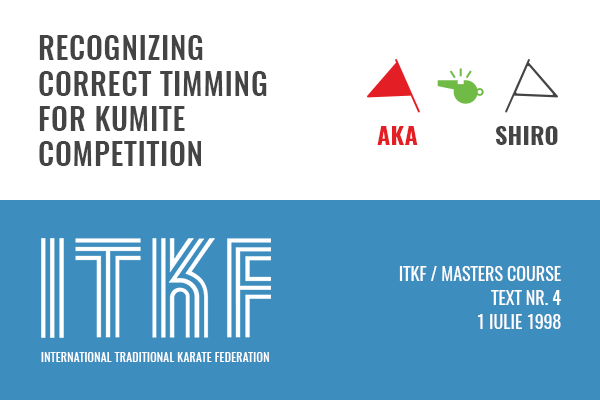 In documentul prezentat: "Recognizing correct timing for KUMITE Competition", am pastrat limba originala in care a fost publicat initial pentru a transmite cat mai fidel nuantele si intelesul acestuia. Catching opponent during general movement. Catching opponent during his delivery of technique. Catching opponent between techniques or body movements. Catching opponent when his mind is stuck on previous technique - a gap of attention before next technique or movement. Catching opponent when his mind is suddenly distracted or unfocused. Catching opponent when mind is distracted or body is suddenly out of balance. If opponent ignores an upcoming technique completely, then any counter-technique is not recognized as scoring.